Not the case with etm. The “event and task manager” was getting updates within days of writing this page. And its Google Group seems likewise engaged. Not enough to enthrall you? How about two different approaches to task and event management? etm in two flavors, e.py and e.pyw, showing much the same information but with a different tack. For the visual learners in the crowd, a nifty diagram and calendar on the left, showing when and where and for how long. 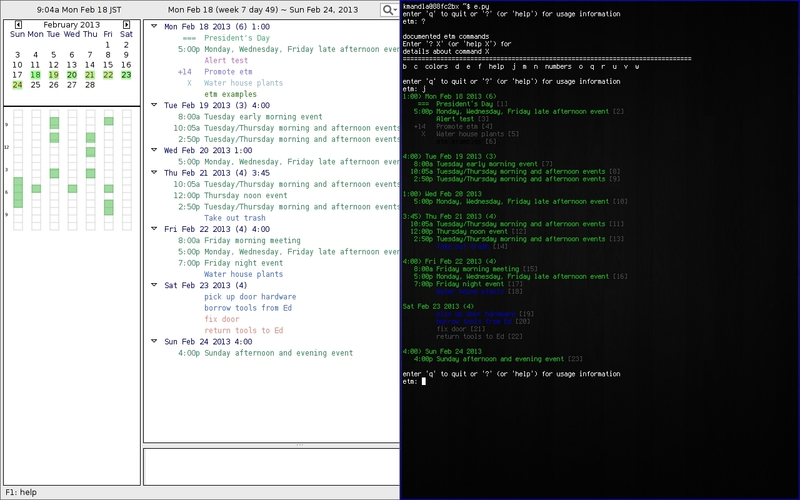 Speaking to the text-based interface, this uses a similar style to things like ikog.py or yagtd, with menu driven controls and event handling. etm is sufficiently detailed that you should take time to read about the flags and switches that control displays and output. Maybe this goes without saying, but I would assert that your satisfaction with etm — in either layout — will depend a lot on how much time you take to learn it. This entry was posted in Linux and tagged calendar, manager, task on 2013/03/20 by K.Mandla. This is not entirely on topic, but have you ever tried moe? It seems to be a rather lightweight gnu text editor with emacs-like keybindings. Aside from its homepage, I have never heard a thing about it, though it looks like it has been in development for a few years.